We took off in the morning with the intent of exploring part of the north coast of Prince Edward Island. 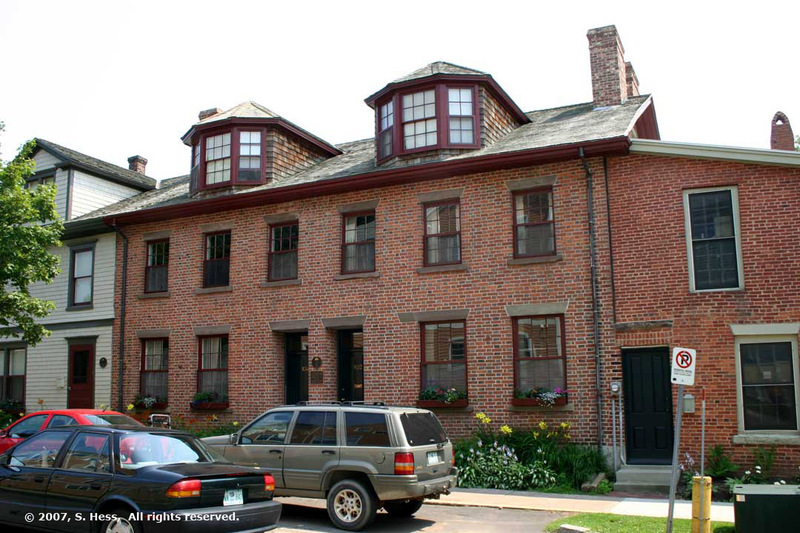 But first, we made the obligatory visit to the Green Gables House, a National Historical site. The main reason we came to Cavendish was due to Susie’s fascination with the Anne of Green Gable series of books. 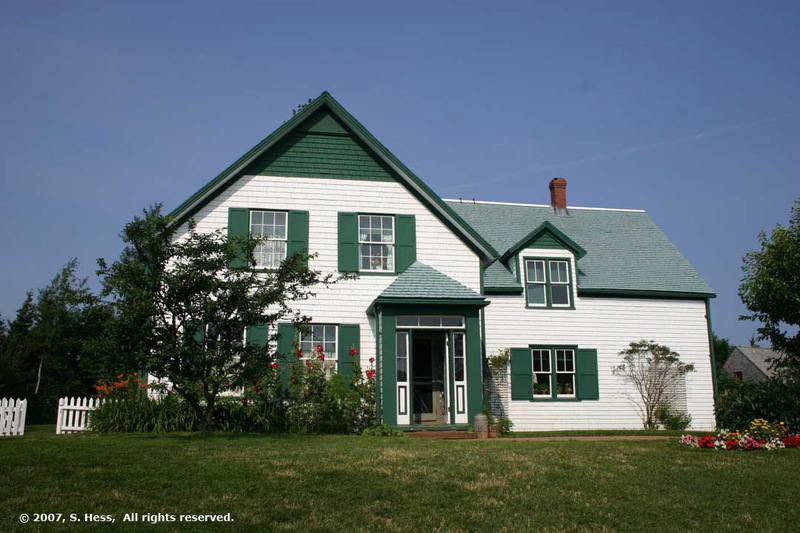 Green Gables was a real place owned by Lucy Maud Montgomery’s cousins. 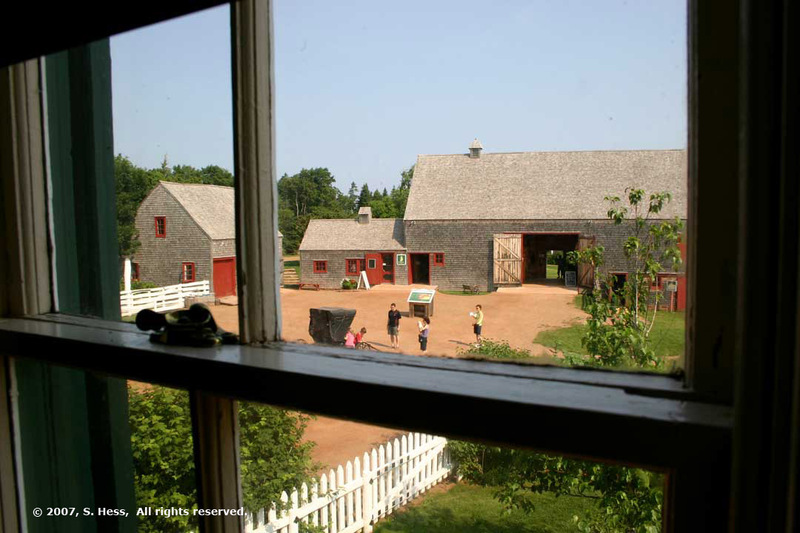 She spent a lot of her childhood at the house and surrounding woods and used much of the real world of Green Gables as the basis for her fictional Avonlea. 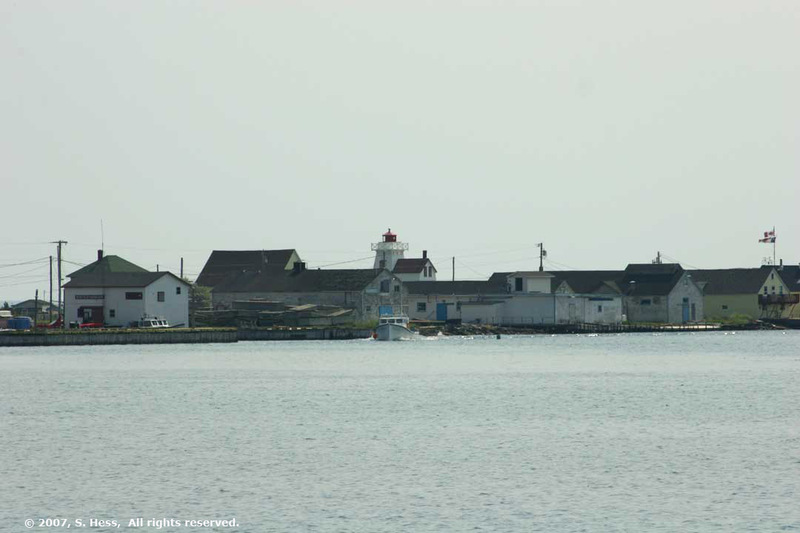 Our next stop was North Rustico Harbor, a few miles east of Cavendish. 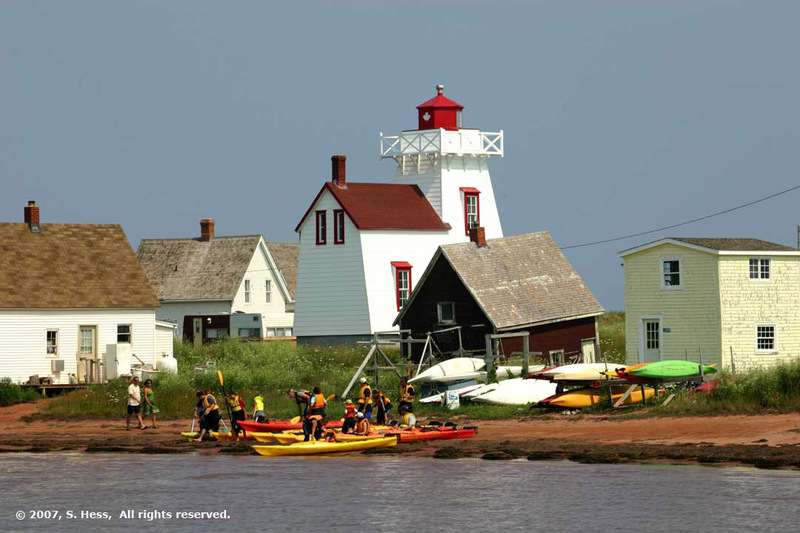 North Rustico Harbor is a fishing harbor that also caters to tourists. There was not much of the fleet at the docks when we were there but we did see plenty of tourists. 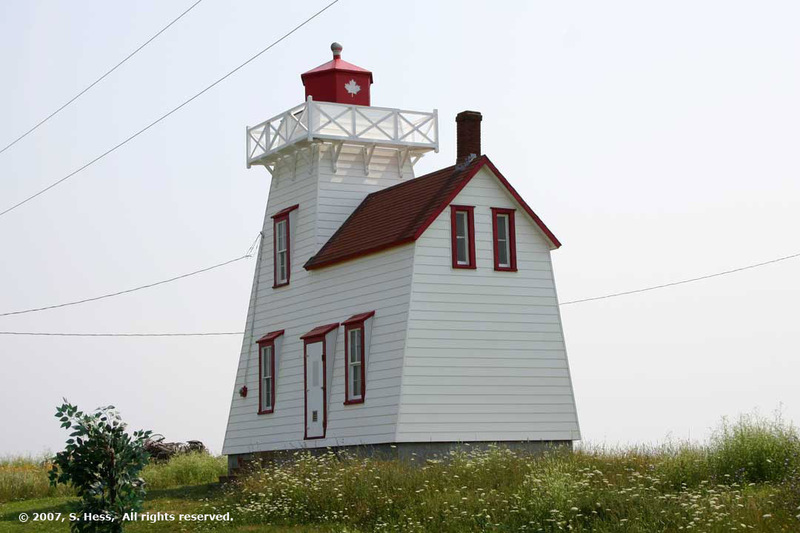 We left North Rustico Harbor and continued east with no real destination. 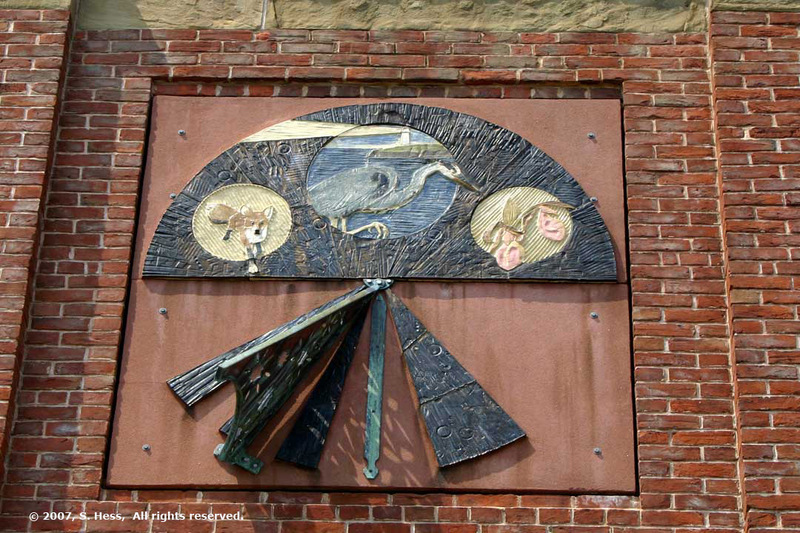 We kept seeing signs pointing to Charlottetown and kept saying, “let’s go a bit further and then head to Charlottetown.” We went as far as Stanhope and the entrance to the Prince Edward Island National Park and turned back. Stanhope, or at least the part we saw, was unlike the other towns we saw on Prince Edward Island. Judging by the homes we saw, we have to say it is an affluent community. There is also a golf course overlooking the bay, as well as a resort hotel that would rate in the above average category. We stopped to eat our lunch on a dock overlooking the beautiful bay. 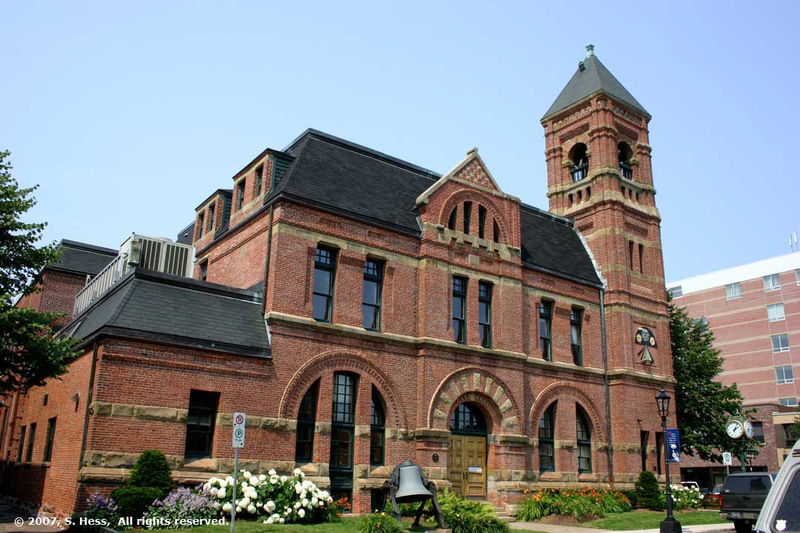 We then headed to Charlottetown. On this part of Prince Edward Island, it seems that all roads lead to Charlottetown and that nothing is very far from the city. The ride from Stanhope took us about 40 minutes. 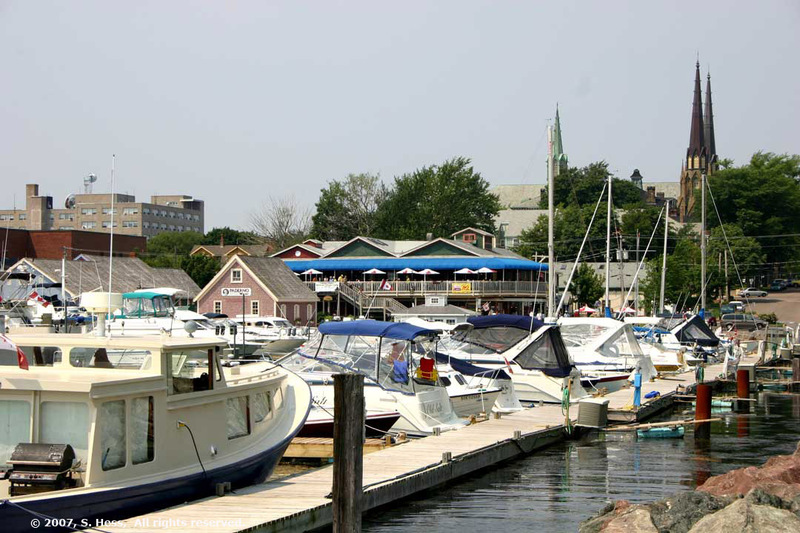 We parked on the waterfront, near Peake’s Wharf and the marina, and walked around the town from there. 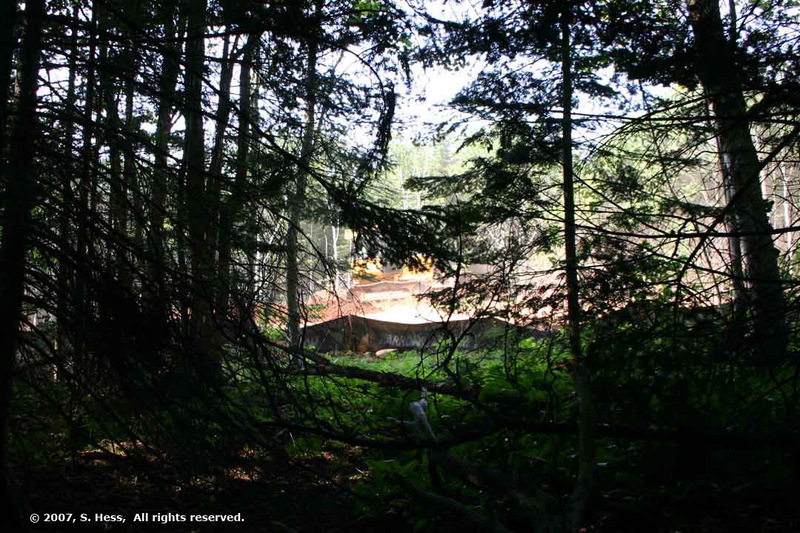 Our first visit, a few days ago, was short and limited to the immediate area of the Confederation Centre of the Arts. We walked around in the area between the Confederation Centre and the waterfront. 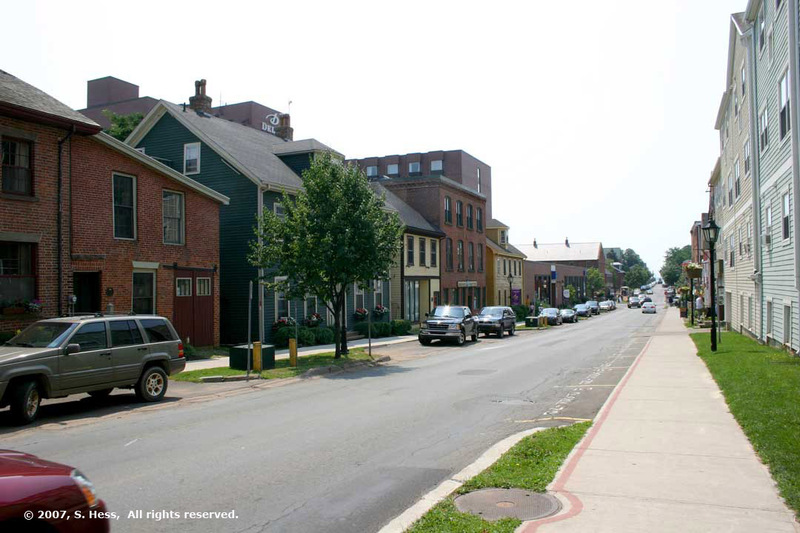 Charlottetown’s downtown area is very compact and we soon found ourselves retracing steps we took on the first visit. This visit increased our favorable opinion of this city. 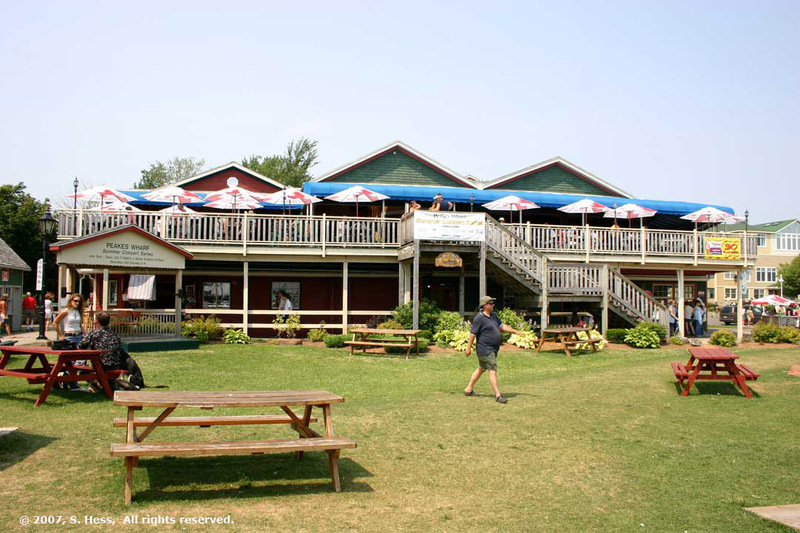 After spending some time in Charlottetown, we headed back to the campground and that is when the day went sour. We were having some difficulty with the slide room binding up when we were retracting it. I went under the trailer to inspect the mechanism and could find nothing obvious. While under the trailer, I noticed that the left front tire was worn down to the steel belt… not a good sign. On further inspection, I found that one of the spring shackles was broken and that the trailer was resting on the worn tire… also not a good sign. We retracted the slide room so that I could remove the tire and replace it with the spare. As I was doing this, the wind picked up significantly and I saw ominous black clouds in the distance. We quickly retracted the awning so that it didn’t get blown apart by the high winds and I went back to work on the tire before the rains hit. I almost made it! I got the tire mounted on the trailer and headed inside to wait out the rain. It rained heavily and the wind was quite strong. Several tents across the road from us were blown away by the winds. While waiting for the rain to stop, or at least slow down, Susie and I decided that we were getting several signs that said, “it is time to go home.” We found a truck repair facility in Summerside, 25 miles from Cavendish, that could do the repairs on Saturday morning. This gave us some relief because it meant that we could drive home safely. Of course, I was still worried about the ride to Summerside. My other concern was the slide room binding in such a way that we could not close it up. We are still concerned with the slide room problem and hope that we could make it to the storage facility in two overnight stops. My big fear is that the room will bind up on one of these stops. I contacted all the campgrounds that we still had not stayed at and canceled the reservations. Lucy Maude Montgomery wrote about these woods, known as Lover's Lane. She said it was a quiet place to sit and listen to the wind, the birds, etc. She didn't have to put up with the bulldozer working on the adjacent golf course. 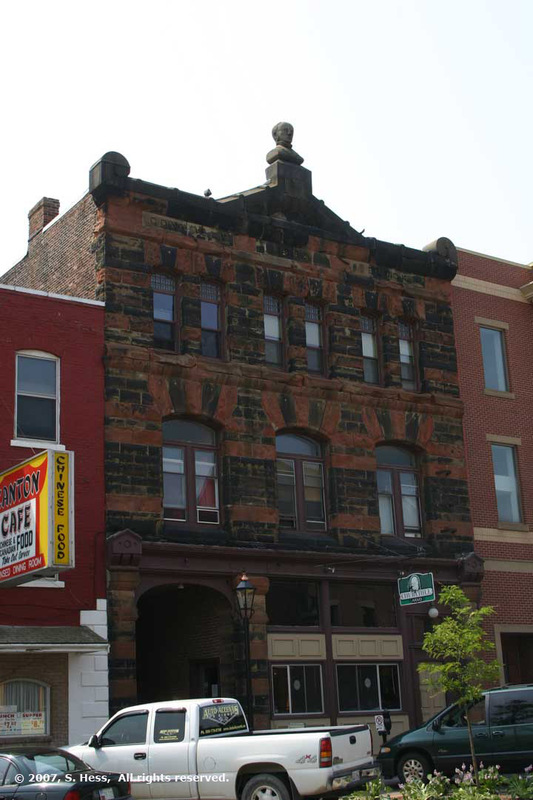 Left, a unique building with a bust of someone on top. Right, Susie and a friend. 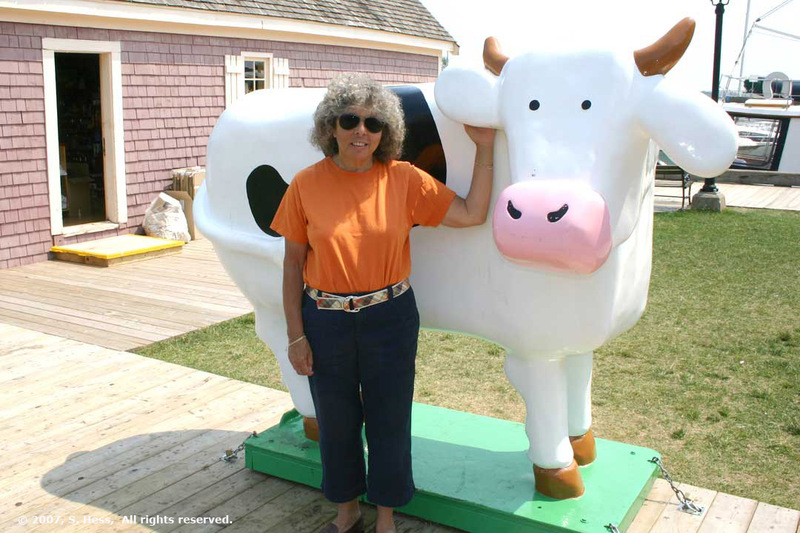 The Cow is a symbol of Cows Ice Cream, supposedly the best in Prince Edward Island. Their Ice cream parlors have more space devoted to selling T-shirts and other Cow related items than to selling ice cream.